MSN TV, of course, was born of WebTV, which was thought up by well-known entrepreneur Steve Perlman. The software giant bought it at the height of the Web 1.0 boom in mid-1997, paying $425 million. The service, which included a dedicated hardware device attached to a television, went through a number of iterations over the years, including being rebranded as MSN TV in 2001. Some of its technology went into the Xbox, but — in general — its recent history was one of dwindling users. 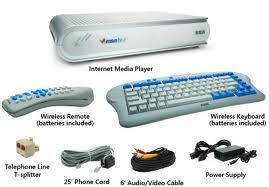 Microsoft’s TV unit also went on to do Mediaroom, software for set-top boxes used by AT&T for U-verse. That business is in the process of being sold to Ericsson (and probably explains the timing of this shut down). But the experience was definitely over at MSN TV. For the past decade, we have been excited to build products that provided our customers with easy access to the Internet on TV. Unfortunately, all good things must eventually come to an end. Today we are announcing that we will be closing the MSN TV service. The last day of the MSN TV service will be September 30, 2013. We want this transition to be as smooth as possible for you. This letter explains what you need to do before the service ends if you want to have access to your email, favorites, Scrapbook photos, Page Builder pages, and any other data. Before the MSN TV service ends, you need to make sure that all the users on your account have upgraded to Outlook.com (formerly called Hotmail), saved any favorites and Scrapbook photos to SkyDrive, and archived any published Page Builder web pages that you wish to save. We have created an MSN TV Closure FAQ that provides detailed information on how to do all of these. Please read it at http://www.msntv.com/msntv/ClosureFAQ.asp. After you have upgraded to Outlook.com, your MSN TV email address, along with your existing email, will continue to be available for you to use. Outlook.com offers many advantages, such as accessing your email from a computer or smartphone that has a connection to the Internet. From a computer or smartphone, you can accessOutlook.com by visiting http://www.outlook.com. If you would like access to your favorites and Scrapbook photos after the MSN TV service ends, you will need to copy them to SkyDrive before the service ends. SkyDrive provides storage in the cloud, so you can easily access and store your favorites and photos all in one place and sync with other devices. You can also share your photos on SkyDrive with family and friends. You can learn more about SkyDrive at http://windows.microsoft.com/en-us/skydrive/overview from a computer or smartphone. To ease the transition and help ensure you maintain Internet access, we will be providing some special offers for both the MSN Dial-up and Premium services. You will need a computer, Microsoft account, and active MSN TV subscription. Visit http://get.msn.com/msntv.aspx to view and sign up for one of these offers. Many of you already have a computer for accessing the Internet. For those of you who do not, we recommend visiting the Microsoft Store for a wide variety of device options. Go to http://www.microsoftstore.com. We want to sincerely thank you for your continued support of the MSN TV service over the years. We have enjoyed bringing this technology to such loyal customers. If you have any questions that are not answered in the MSN TV Closure FAQ, you can contact Customer Support at 800-469-3288 between 6 am – 8 pm PST. Again, we want to thank you for your support and commitment to Microsoft products.